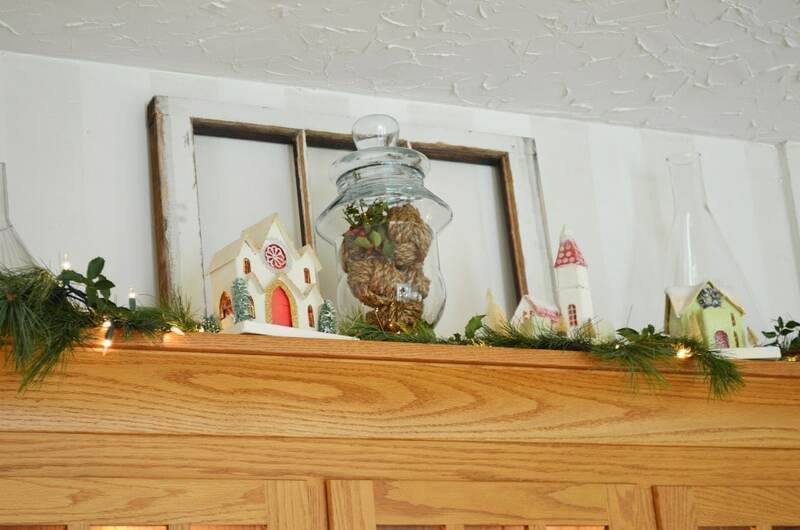 Time to get more holiday decor pics up! I’ve got a bunch – here are some of them! Top of my china cupboard in the dining room. I started out with some pinky red ornaments in the jar but switched to my rope knots. Like this look better! 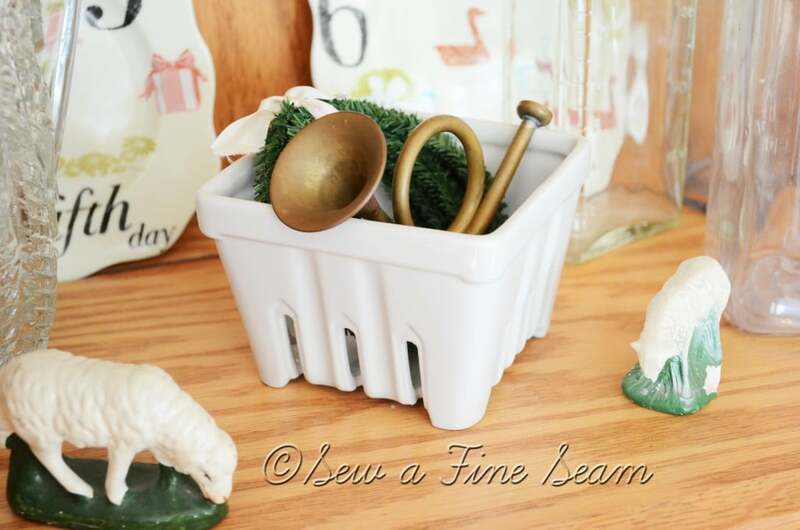 One of the little vignettes inside the cupboard. This one is one of my favs. 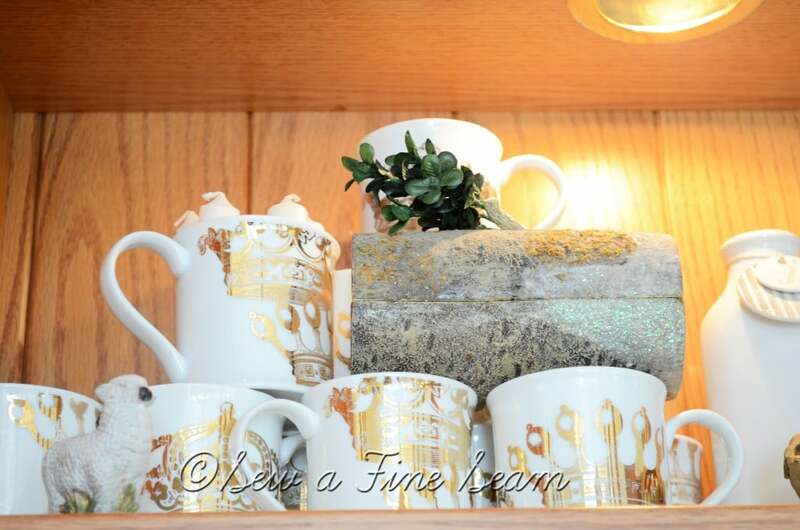 Crown mugs by Rosanna and a glittered yule log. I displayed my 12 days of Christmas plates this year. I love pulling them out to use them for desserts at Christmastime. 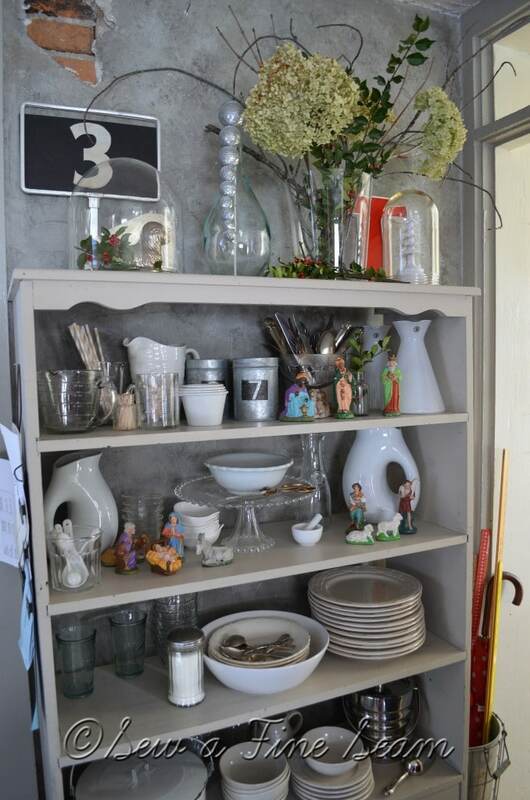 Don’t you think this cupboard would look SO pretty painted white? I’m trying to convince hubby that it would be ok to paint it. Little bit of holiday bling added to my wooden shoe lasts. 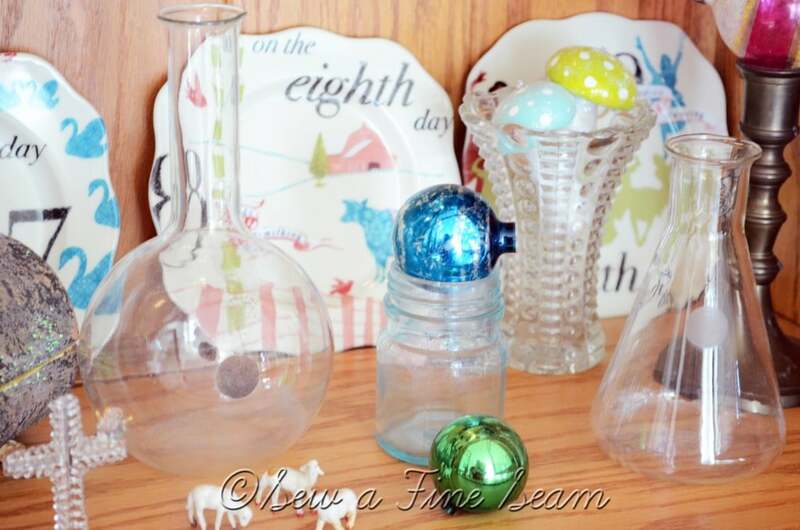 These were one of the recent deals on Decor Steals. They have such great stuff and I just can’t always pass it up! 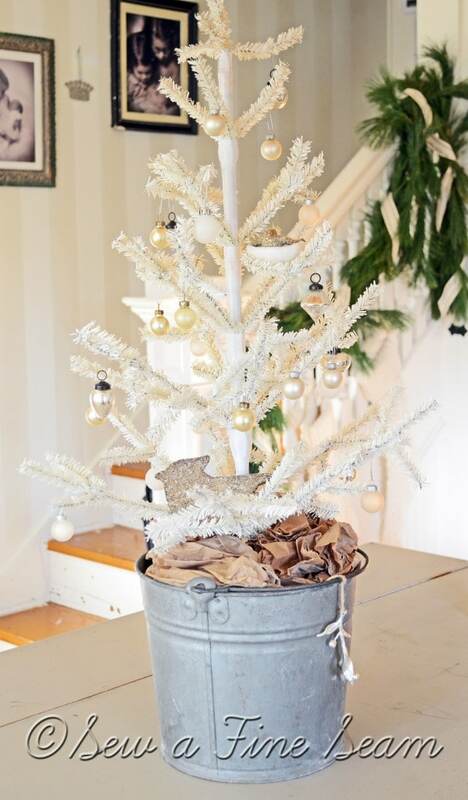 My $.99 tree found a spot in an old bucket and graces my dining room table. 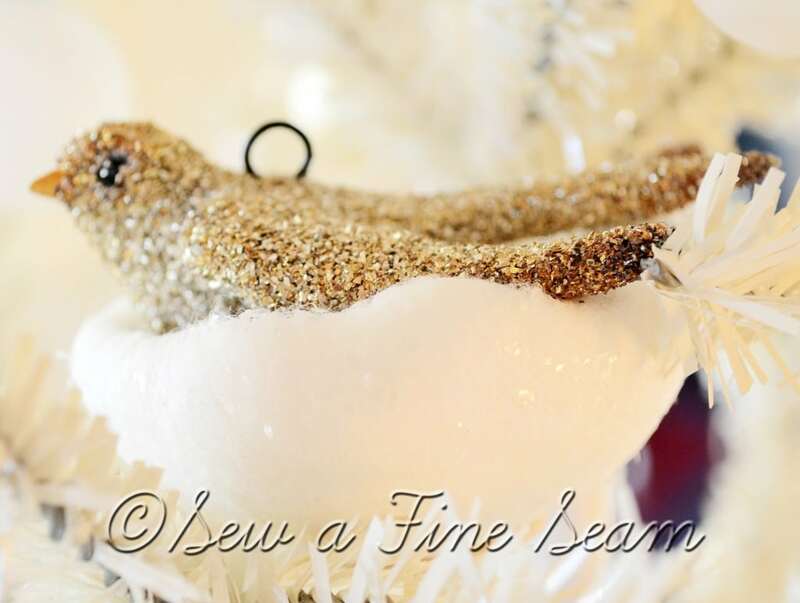 This glittered bird was a find last year after Christmas. 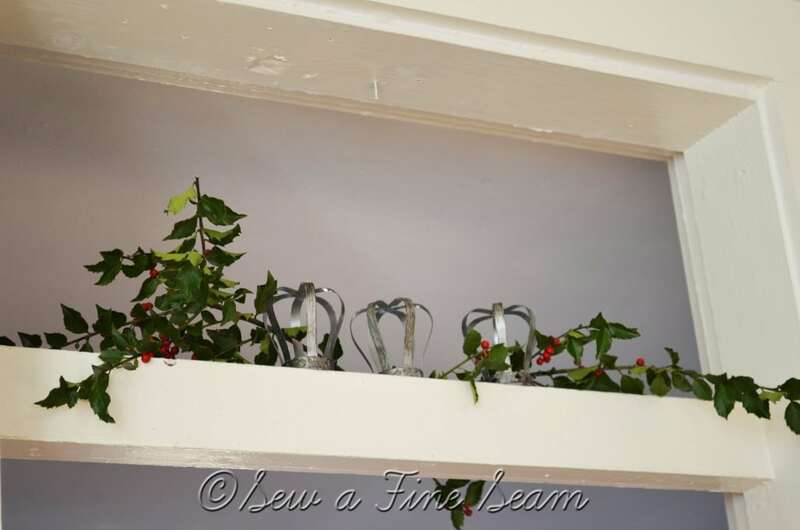 The mistletoe was a purchase this year at Crate and Barrel. Another after-Christmas-purchase from last year. The white knit stockings are from Lands End and were a Christmas gift from my Mom a couple years ago. I am loving the view from my dining room into the kitchen. 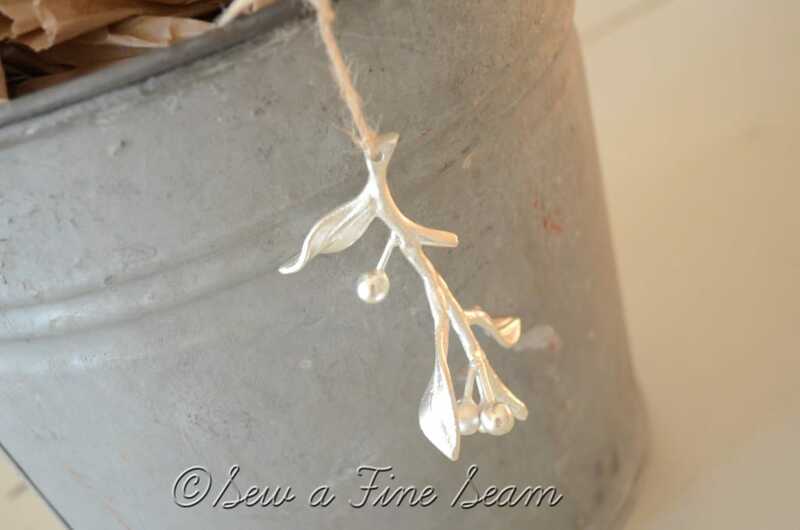 The wire tree in the kitchen has held my blown glass ornaments for years. This year the girls put those ornaments on our big tree and the wire tree now holds deep red ornaments I’ve had for years and years. I love how the two trees look together here. Vintage print from an old book – I’ve had this for years and years too. 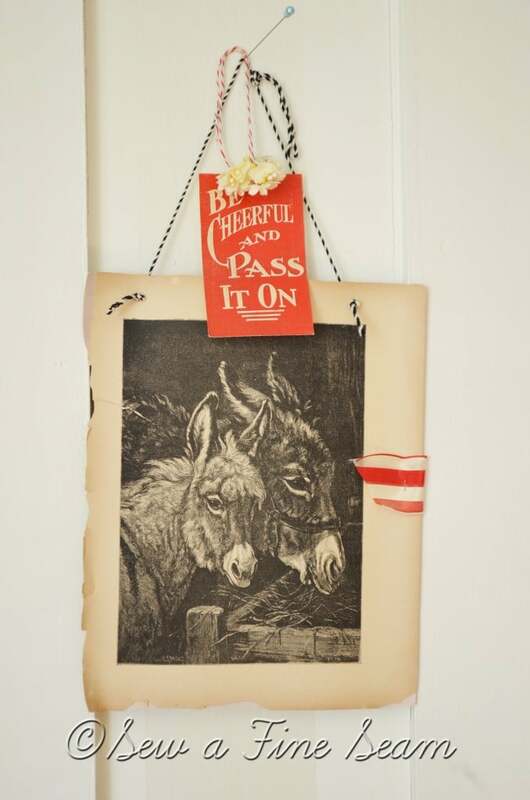 The ‘Be Cheerful’ tag is from the days of McMaster and Storm’s brick and Mortar shop. Several of our interior doors have transoms. This is what I put in one of them. Top of my open shelves in the kitchen. I had a vintage nativity left over that I didn’t have a spot for this year. So I tucked it on these shelves. It’s spread out a little but I like it that way. My kitchen window. I found these deep red, vintage ornaments at Goodwill for $.99 a few weeks ago!! A little better view of a little of my kitchen. See how small it is?! I mean it when I say my kitchen is not very user friendly. To read more about how I painted my kitchen go here, and here, and here. Greenhouse on top of my refrigerator. I rather like the look of my dried Hydrangea blooms with the holly branches. 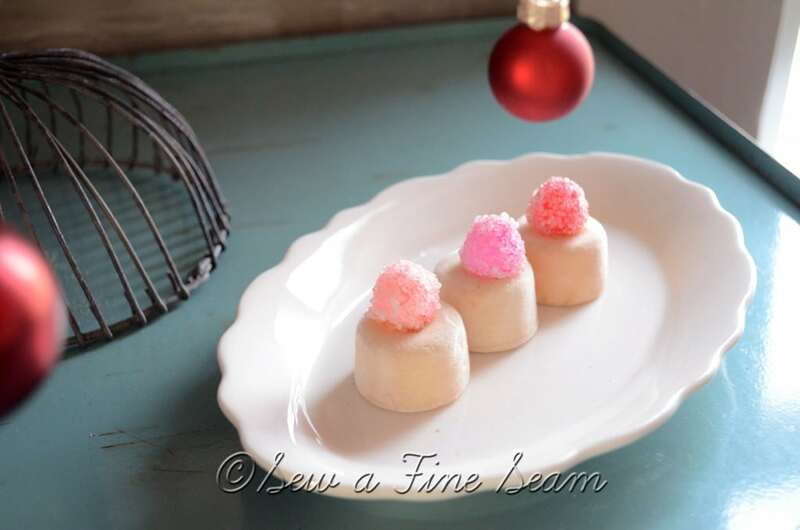 Vintage Faux Candies – these were included in a huge lot of vintage goodies I bought on ebay years ago. 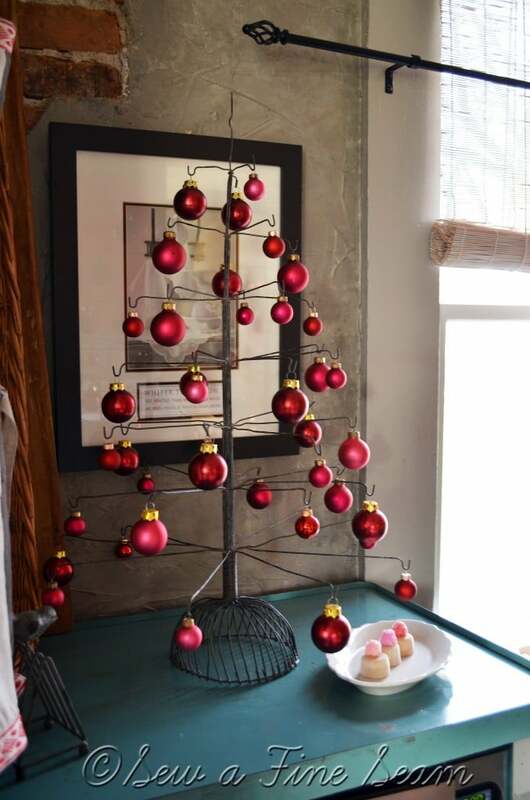 A closer look at my wire tree covered with dark red balls. 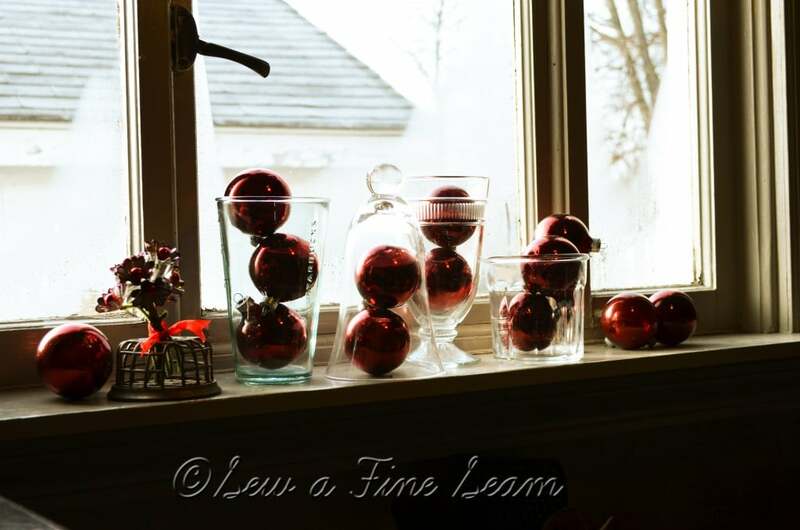 It was fun how the red all ended up coming together in my kitchen this year. Hope your week is going great! I have a few more decor things to share if I get time! Jill your home looks amazing, so warm and inviting. Especially loving the shoe lasts, greenhouse and stairs. 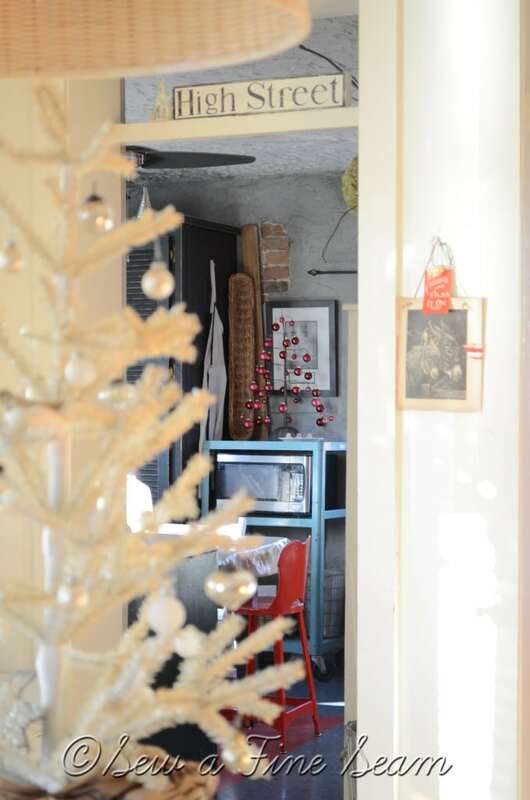 I love seeing areas of your home I haven’t seen before ~ and decked out for Christmas couldn’t be better! 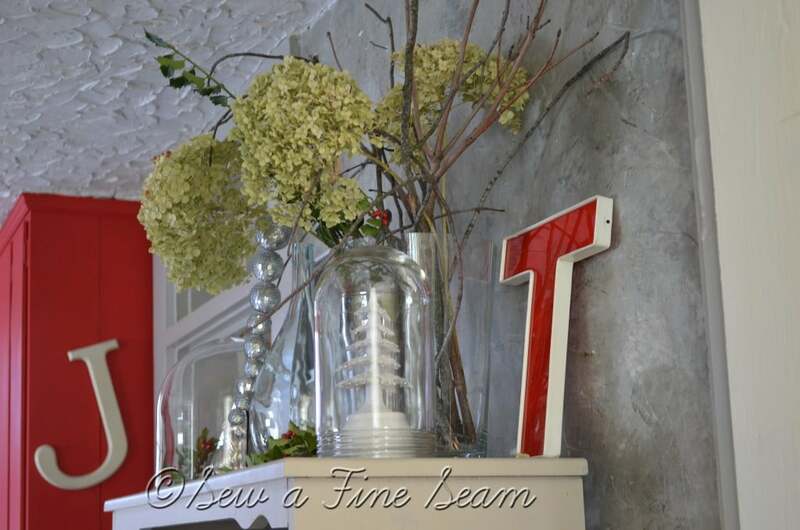 Your bright festive touches throughout are absolutely charming! Wish I could come have coffee with you and take it all in! Thanks Pam – I wish you could come over for coffee too! Yes, yes, yes! 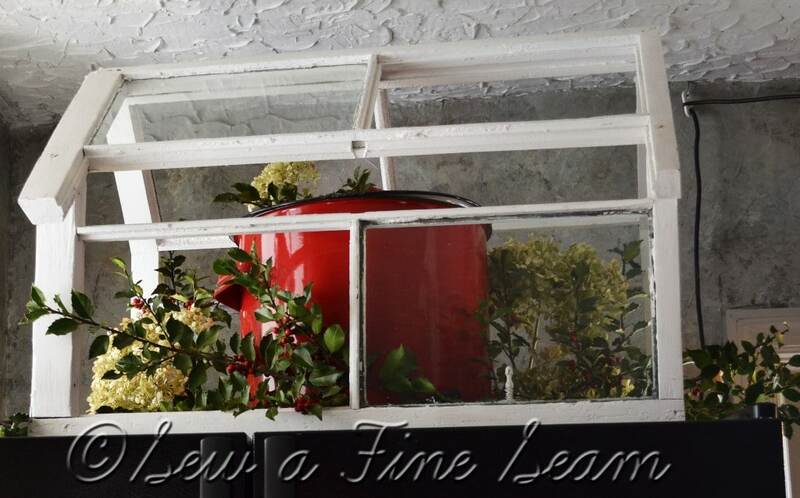 Tell your hubby that the cabinet painted white would make it blend in with the country vintage charm of your home. I love white hutches!! I love all of your vintage style Christmas decor. 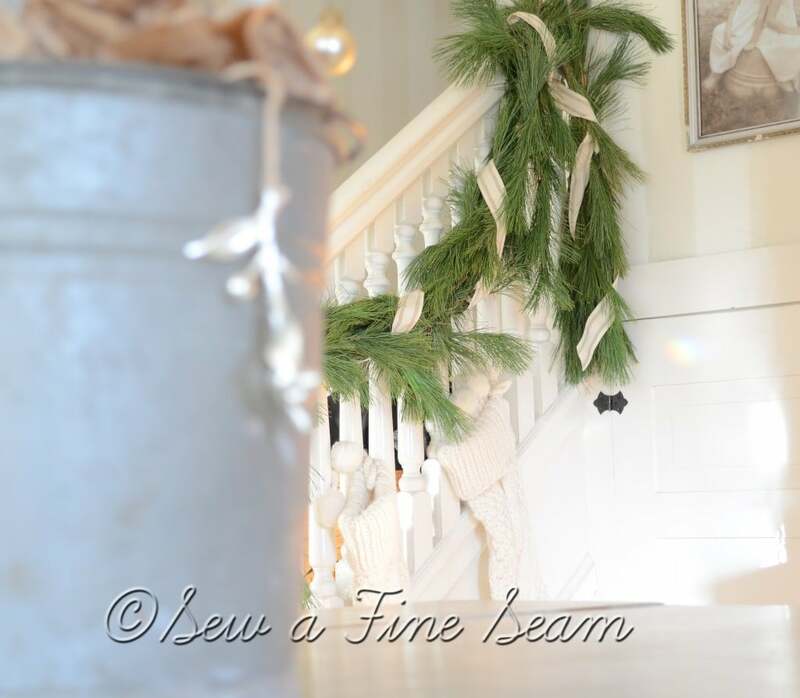 The stockings hanging off your gorgeouse stair bansiter looks great. 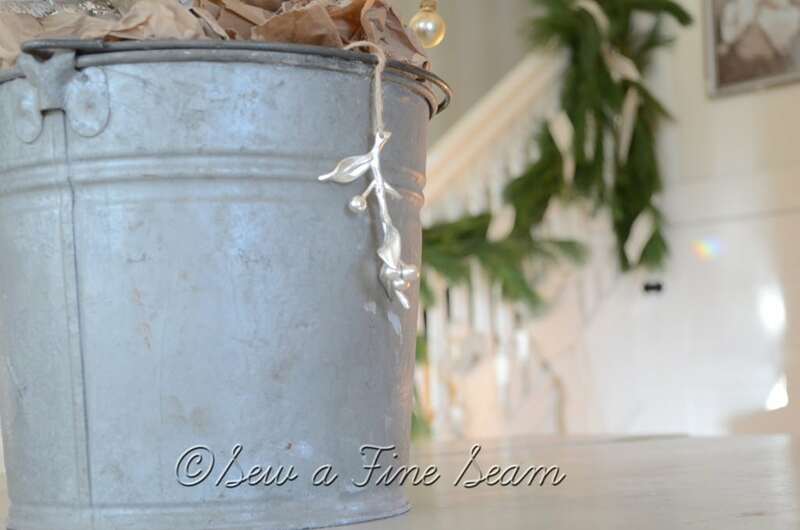 Love that white Christmas tree in the bucket too. So many cute things everywhere. I also really like that print you found at McMaster and Storm. Thank you Kelly! I’m working on hubby – it will happen eventually! 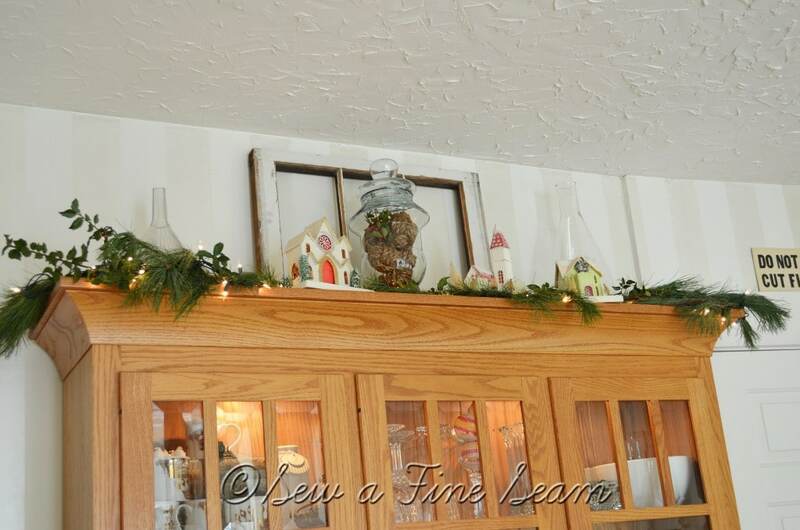 Funny that you asked about your china cabinet – I was just thinking – Now that doesn’t look like Jill! 🙂 It would be very pretty white of course, but men don’t like to see “nicely” stained furniture “ruined” with paint. Your brick showing in your kitchen is so neat! 🙂 Melanie it doesn’t look like me anymore does it? We got it about 12 years ago when Emma was 18 months old. Since I have almost no kitchen cabinets Travis bought me the cupboard. I am so glad it is the style it is – I still love that. But now I want it white. It will happen – eventually! I know Amy, I know. I’ve had that hutch for about 12 years. I still love the style – just ready for it to be white!! It wasn’t as red when we bought it – don’t like the way red oak does that. Hubby doesn’t love that it has darkened either but he is being stubborn about letting me paint it! I’m going to keep working on him though, and trust me, it WILL get painted! Jill I don’t know where to begin. I love your tree, what a deal! And your styling is wonderful. 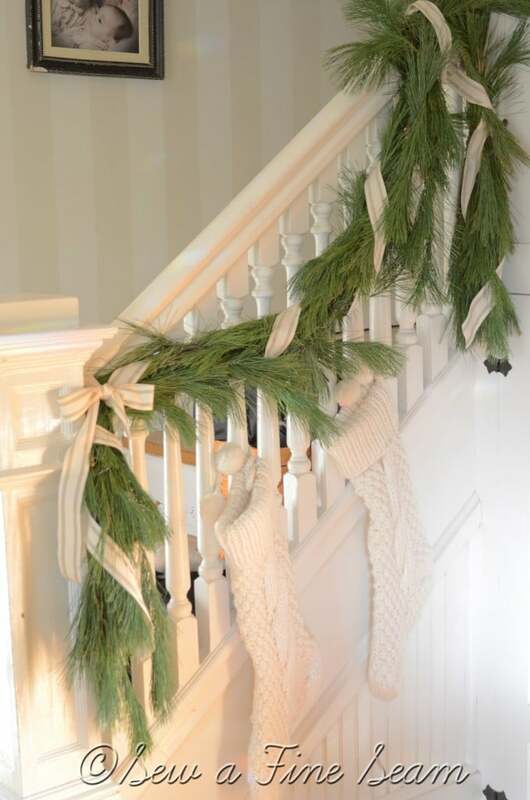 Plus, I want those Christmas stockings… they look perfect hanging on your stairs with the garland and cream colored ribbon. I could go on and on but you’ve motivated me to finish my decorating. Haha. Thank you Leslie – you make me blush! Such a complement coming from you – someone I admire – is the best gift ever! 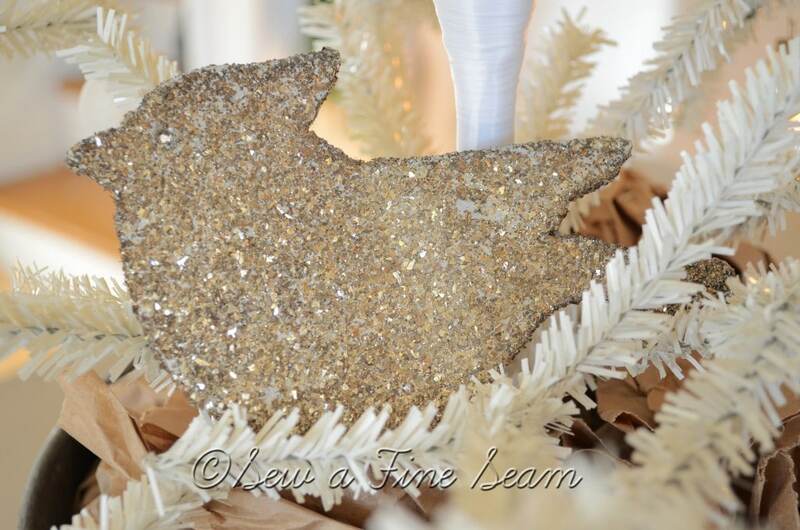 So many charming holiday details and collections! 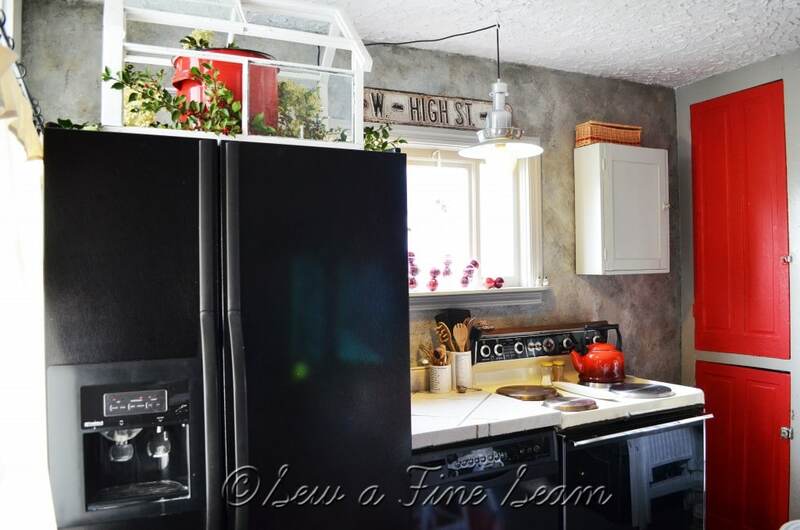 Love your kitchen too…very cool! !